A brilliant day-in-the-life video from Yamaha, featuring the Yamaha MotoGP racers. Thanks to Big Bob for pointing this one out. The Associated Press reports that there is little hope in the near future for kid’s dirt bikes. The buzzkills staff of the Consumer Product Safety Commission have issued their recommendation that dirt bikes and ATVs not be exempt from the recent lead product ban. Sales of dirt bikes designed for children have been halted since a new law prohibiting the sale of any product containing more than a miniscule amount of lead went into effect February 10. You can contact your Representatives and the Consumer Product Safety Commission at the AMA’s Rapid Response page. Jay Leno’s Garage is one of the best sites in the world. Leno’s collection of cars and motorcycles is legendary. And he’s a true enthusiast, who loves these vehicles and enjoys getting them out and on the road. I think he’s awesome. Here’s a recent segment where he talks helmet sizing and construction with Arai’s Bruce Porter. Leno has had his share of crashes, so he speaks from experience when he promotes helmet use here. 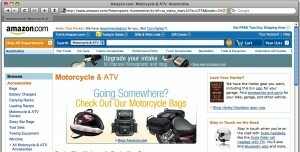 [/caption]Amazon has sold various bits of motorcycle gear for some time, but now they’ve pulled it all together under a Motorcycle & ATV section. It’s convenient to have everything in one spot and they have a pretty broad selection of gear. Unfortunately, the product categories are a mess right now. Parts includes communication systems and balaclavas and many more non-parts items. Don’t even bother with the sub-categories — browsing the Parts/Engines sub-category right now doesn’t turn up a single engine part of the first page. Most sad is the Vehicles category, which turns up a page that’s almost entirely pocket bikes. This has the potential to be really useful. I just hope that Amazon and their sellers can get their acts together and get this thing organized. MotoGP is rolling into Indianapolis for the first world championship motorcycle race ever held at the Indianapolis Motor Speedway. It’s also going to be the first MotoGP race that I attend. When the MotoGP left Laguna Seca almost a decade and a half ago, I wasn’t a big racing fan. And since its 2005 return to California, I haven’t had the chance to go. Now I’m in Chicago and tomorrow I’ll be driving down to Indy. I can’t wait until practice starts on Friday. I still have no idea what to expect. MotoGP coverage in the U.S. is pretty thin and doesn’t show much beyond the actual race. Faster, one of the best motorcycle documentaries ever made, did an awesome job of capturing the spectacle of MotoGP around the world. Still, I don’t know how that’s going to translate to the middle of Indiana. But I’m going to find out. BMW dealers now have the new F 800 GS in stock — no, wait, it’s the F 650 GS, but it’s using a new twin-cylinder engine based on the F 800 GS engine, and it displaces 798 cc. 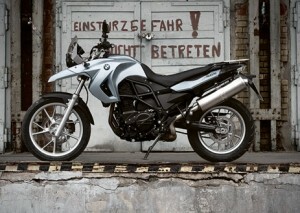 But it only puts out 71 hp versus the F 800 GS’s 85 hp. Confused yet? Me, too. I’m not certain why BMW has chosen to keep the “650” moniker while significantly increasing displacement (I guess F 800 GS Lite sounds lame), but there’s no question that the specs are a welcome upgrade from the previous single-cylinder model. I can’t wait to try one of these out. Tame the urban jungle or take the road less traveled! After much anticipation, BMW’s sophisticated new addition to its entry level model lineup — the 2009 BMW F 650 GS — has arrived at U.S. BMW Motorrad dealers. With its 71 hp, torquey twin-cylinder engine, the all-new 2009 F 650 GS offers more power and sophistication than its single-cylinder predecessor. Ideal for on- or off-road riding, urban commuting and any rider looking for a fun, efficient and reliable motorcycle, the middleweight twin tackles anything the ambitious motorcyclist could throw at it. Its rigid steel tube trellis frame, double-sided swing arm and chain drive offer reliability. A low seat height and narrow design make navigation through the worst traffic a breeze. Cast aluminum wheels and telescopic forks keep the ride smooth and precise at all times. The 2009 F 650 GS has a manufacturer’s suggested retail price of $8,255 (excluding freight). The Standard Package, offered at a manufacturer’s suggested retail price of $9,760, (excluding freight) includes heated hand grips, Anti-Lock Brakes, an on-board computer, and white turn signals. The 2009 F 650 GS is available in three colors — Flame Red, Iceberg Silver Metallic, and Azur Blue Metallic. The F 650 GS is the newest addition to BMW’s dual-sport line up. It follows in the footsteps of the highly acclaimed R 1200 GS – which traces its roots back to the early 1980s when BMW won the grueling Paris-Dakar rally four times with its trailblazing dual-purpose R 80 GS. Since their debut in 2004, the versatile R 1200 GS and its rugged companion, the R 1200 GS Adventure, have earned praise from motorcycle enthusiasts and the press for their exceptional performance both on and off the road. The R 1200 GS has earned award after award, including Cycle World’s Best Open Class Street Bike and the International Journalist’s Panel “Best Bike in the World.” The R 1200 GS Adventure was named “Best Adventure Bike” three years in a row by editors of Motorcyclist Magazine. 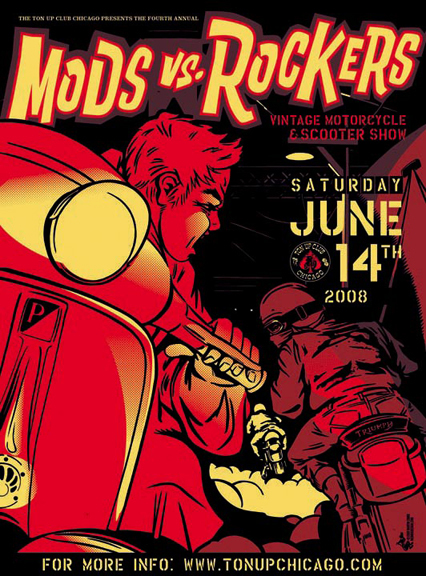 The 4th Mods vs. Rockers vintage motorcycle and scooter show happened yesterday. Eric Robinson has already posted a great flickr set from the event. The photos include bikes, scooters and even a couple classic cars seen at this year’s MvR. Be sure to check them out. Nice job, Eric. "Look Twice for Motorcycles" Comes to the U.S. The Think! Take Longer to Look for Bikes campaign from the UK has landed in the US with an Americanized version of the public service announcement. You can see the original UK version here. Be forewarned, the UK version is a bit more graphic. Back in February, the Cool Hunting blog featured Blonde Redhead drummer Simone Pace. In addition to talking about his music and the band, Pace spends some time showing off his vintage Moto Guzzi and talks about his passion for motorcycles.